Drug prices are likely to increase as rich countries and their pharma companies squeeze Indian generics out of the market. How can India’s public healthcare stand up to the challenge? Trade agreements with stiff intellectual property protection requirements combined with buyouts of India’s top generics makers by multinationals threaten to deny affordable medicines to millions of poor. Udyog Bhavan, the warren of offices that houses the Ministry of Commerce and Industry in Delhi, is as staid as government offices go. But several times in the past year there has been unwonted excitement at its entrance. A motley group of people, some of them holding placards, has held demonstrations, forcing the authorities to swing into action and cart them off to the nearest police station. Such protests have occurred each time European Union (EU) officials came here to discuss the free trade agreement (FTA) with the Indian government. Who are these people and why should discussions on an economic agreement between India and the EU worry them? The protesters are people living with HIV/AIDS and cancer, lawyers and international humanitarian organisations such as Medecins Sans Frontieres (MSF). They are worried about the implications of the EU-India FTA, which has a section on intellectual property that threatens to stifle the manufacture of generic medicines in the country. Generic medicines are the cheaper equivalent of innovator products, usually manufactured after the expiry of the patent on the branded drug. The global interest in the EU-India FTA negotiations—it was kept under wraps till recently—is easily explained. India is the pharmacy of the world because generics made here are used globally by non-profits (the Clinton Foundation, the Bill and Melinda Gates Foundation) to treat patients with lifethreatening diseases such as HIV/AIDS, cancers and other diseases. For instance, over 85 per cent of the 154,000 HIV/AIDS patients MSF treats in 27 countries depend on generics from India, and thanks to competition from Indian generics, the cost of treatment for HIV/AIDS has decreased dramatically in the past decade (see: ‘Indian generics companies slash costs’). In addition, there are government health programmes in over a dozen countries— Brazil, Ecuador and Thailand, for example— that source generics from India. Leena Menghaney, project manager of MSF’s Access To Medicines campaign in India and one of the protesters picked up by the police last year, said, “How do we treat our patients without India?” It is not only the third largest producer of generics by volume (see: ‘India, a major producer of generic drugs’ on opposite page) but also one of the least expensive drug producers (see: ‘As cheap as it can get’). While the domestic retail market, as per market researcher ORGIMS, is valued at Rs 55,454 crore in 2008- 2009, exports are worth Rs 38,433 crore. The crux of the problem with the EUIndia FTA is data exclusivity. Unconfirmed reports say that the giant trade bloc is seeking data exclusivity for 10 years but is likely to lower it to five years after the usual bargaining in the negotiations. But why is data exclusivity such a feared beast? It is a new type of intellectual property right (IPR) that goes beyond what is mandated in the World Trade Organisation’s TRIPS agreement— like the new-fangled IPR enforcement measures, such as the Anti-counterfeiting Trade Agreement (ACTA), pushed aggressively by Organisation for Economic Co-operation and Develop-ment (OECD), the club of rich nations. Data exclusivity is intended to extend the exclusive rights of innovator companies more than patents would, by not allowing the drug regulatory authorities to rely on test data already in their possession for subsequent approval of generic versions of the drug. For instance, if an innovator company submits data related to the new use, such as for paediatric use, of an old drug, the company is then assured a further monopoly even if the medicine is not protected by a patent. “This will destroy the benefits of section 3(d) of the Patents Act, which does not allow any patents on improvements of medicines such as paediatric versions,” points out a patent attorney. This would be a double whammy for Indian generic makers because exclusive rights on pharmaceutical data would prevent drug regulatory authorities from relying on test data in their possession for subsequent approval of generic drugs. What it means is that generic versions of a medicine cannot be registered for that period unless the manufacturer carries independent tests showing the safety and efficacy of the drug. Given the limited finances of generic firms and the time required for clinical trials to generate such data, the result would be no generics. Worse, even non-patented drugs would face such barriers, creating a market monopoly for innovator firms. The EU-India FTA also seeks to equate ‘data protection’ with ‘market exclusivity’, a provision with lethal implications for the generics industry in India. The draft FTA proposes that “any information submitted to obtain a marketing authorisation” will “benefit from a (yet to be determined) period of protection against unfair commercial use starting from the date of grant of marketing approval”. Net result: no generic equivalent will be allowed to enter the market unless the subsequent applicant submits independent data (or data used with authorisation of the right holder). Analysts point out this goes well beyond what Article 39.3 of the TRIPS Agreement requires. These concerns have been voiced even by the European Parliament’s working group on innovation, access to medicines and poverty related diseases. Yet, not everyone agrees this is the most lethal of threats confronting the industry. D G Shah, secretary general of the Indian Pharmaceutical Alliance (IPA), said, “The FTAs do not appear to be a major concern for the pharmaceutical industry because it is well drilled in the minds of the bureaucrats that concession for IPRs is different from concession for goods. The MFN (most favoured nation) status accorded under the TRIPS requires that all countries are given the same treatment as parties to the FTAs.” In other words, they would be careful not to make IPR concessions that would apply to all WTO members. This is a surprising change in stance for IPA, which represents 15 of the top generics makers and has expressed misgivings about the FTAs being negotiated with the EU and Japan. But Shah says the new comfort is based “on the assurances given by the commerce secretary and the stand taken by India on these agreements”. Are MNCs the bigger threat? So where does the real threat lie? According to Shah, the greater challenge comes from the MNC agenda for protection and enforcement of IPRs. “Many in the government still think that equity and fairness demand we must protect IPRs at all costs. They, therefore, endorse the concept of border enforcement, without adequate safeguards. The customs are not equipped to handle the nuances of IPR violations,” he said. Shah was referring to the series of seizures made by certain EU countries of shipments of Indian generics to third countries, particularly in Africa and Latin America, 2008 onwards. These seizures made by the EU—under Regulation (EC) No 1383 of 2003—are being used by drug MNCs to target shipments of Indian generics to needy nations. “The State must not take the responsibility of the right holders. However, in the name of consumer protection and fairplay, some argue that this distinction is illogical,” said Shah. Indian generic companies with exports close to Rs 40,000 crore in 2008-09 could find themselves seriously constrained by such initiatives. Not everyone believes the threats are all external. Amit Sen Gupta, who works for the Centre for Economic and Social Studies in Delhi, is of the view the dangers are closer home. Sen Gupta, also general secretary of the All India People’s Health Network, points out that the fundamental issue is the neglect of public health by the government; its budget for health is four per cent of the GDP. “I do agree that the FTAs and the campaign to impose TRIPS-plus conditions on the generics industry need to be countered. But the most detrimental factor is the abysmal government outlays on health. Because of this the public health system does not absorb the manufacturing cost of medicines,” Sen Gupta said. In Sen Gupta’s view this makes for a rigged generics market. “The biggest barrier to access to medicines is that less than 10 per cent of the medicines are absorbed by the public health system and close to 80 per cent of the out-of-pocket expenses incurred by the poor, are on medicines,” he said. Most industry watchers tend to agree with Sen Gupta’s view but say none of the threats can be termed as lesser or greater. For Reji K Joseph, consultant with RIS (Research and Information System for Developing Countries), a Delhi think tank funded by the Ministry of External Affairs, a serious danger is the increasing buyouts of leading Indian generic companies by the global drug giants. In fairly quick succession, Indian companies have been bought out by foreign firms, raising the question whether we would have an industry left to protect. Leading generics maker Ranbaxy, vaccine manufacturer Shantha Biotechnics, and the injectables business of Orchid Chemicals and Pharmaceuticals have all gone to foreign drug majors (see box: ‘Going, going...’). What does this imply apart from higher medicine prices? Joseph warns this is a potent issue for the health security of the country, a view echoed by K M Gopakumar, legal adviser to Third World Network, a think tank on North- South policy issues. “The share of patented drugs will increase as acquisitions and mergers become the trend. This will create dependency on MNCs, and we will be back to the pre-1970s situation (before the generics industry took off in India),” Gopakumar said. This is far from being the complete list of threats looming over the generics industry. Among other concerns are proposed enforcement measures like ACTA, which although aimed ostensibly at a wide range of fake products from software and Internet applications to pharmaceuticals, clearly has the latter in its sights. Michael Geist, a professor at the University of Ottawa who is a staunch critic of the ACTA process, was quoted by IP Watch as saying that at “the end of the day, ACTA is about Brazil, India and other emerging economies”. Global research organisations and non-profits like Knowledge Ecology International and civil society activists warn ACTA could have a profound effect on access to medicines and has the potential to criminalise manufacturers of active pharmaceutical ingredients (APIs), who provide the critical foundation for the generics industry. It is obvious that generics firms need to guard their flanks from onslaughts of various kinds, and from every possible angle. But for Shah and a host of others, the biggest challenge to the industry and the patient is from the implementation of the Patents Act, 1970, which India amended in 2005 to allow products patents. Notwith standing section 3(d), which excludes a number of products not patentable in India, Shah points out that a large number of patents have been granted which are prima facie violative of the law. “There is intense pressure on the government to amend the Act to dilute patentability norms. The courts, too, are facing the heat (see: ‘Pharma giants challenge Indian laws’ on the opposite page). One wonders how long the executive and the judiciary will stand up to the multinationals and fight for patients.” How long indeed. In an ideal market economy competition lowers prices of consumer goods. It is just the opposite in the case of pharmaceutical products. More expensive brands sell more. Take Cyclovir, an ointment for treating skin infection caused by herpes. Its therapy cost (cost of one course) is Rs 812, while a similar drug, Herpex, costs Rs 1,666. Both brands, marketed by different pharma companies, have the same salt—acyclovir. Yet the annual sale of the costlier Herpex brand was worth Rs 3.17 crore while that of Cyclovir was just Rs 57 lakh. 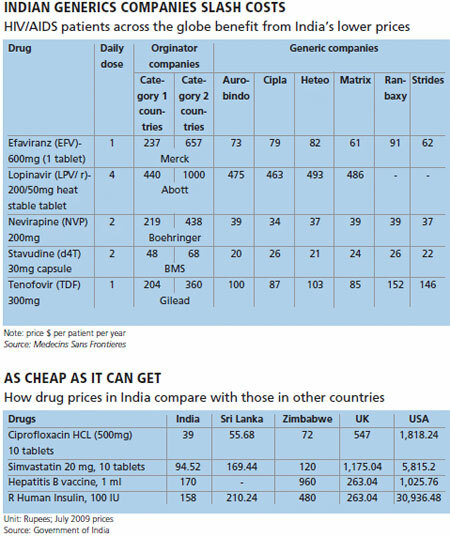 An analysis of India’s National List of Essential Medicines confirms that the brands that sell the most in the country are not necessarily cost effective. Of the top selling 300 drug brands that account for annual sales worth Rs 19,000 crore, only 115 brands, covering 68 drugs, are in the essential list, according to ORG-AC Nielsen, a market research agency. This means most brands are the ones which are neither essential nor cost effective. What’s more, many drugs in the essential list, totalling 364, are not covered by the government’s price control order. Cifran (Ciprofloxacin), an antibiotic manufactured by Ranbaxy and included in the essential drugs list, costs Rs 9 a tablet. Its cheaper version costs Rs 2 but does not sell much. Expensive drugs ride on aggressive promotional campaigns by pharma companies who offer incentives to doctors. Recently, a company that markets epoetin alfa for treating kidney malfunction, sponsored some 300 doctors and their spouses who attended a three-hour workshop in Singapore with an extended three-day stay thrown in. The company brand has the highest sale, said C M Gulhati, editor of Monthly Index of Medical Specialities (MIMS), a journal published from Delhi. Gopal Dabade, activist with non-profit Drugs Action Forum in Karnataka, said it is hard to break the nexus between pharma firms and doctors. “The Medical Council of India’s blanket ban on doctors accepting gifts, travel sops and hospitality from pharma companies in lieu of promoting their products has not seen the light of the day,” he said. “As for prescription audits (to prevent doctors from prescribing expensive drugs), the question is who will keep an eye on private doctors?” he asked. The crumbling public health system ensures over 80 per cent patients approach private practitioners, said Gulhati. Since controls on private doctors are few, many prescribe expensive drugs that drain people’s resources. Even government doctors prefer branded drugs over generic ones. Studies show healthcare is the second leading cause of rural indebtedness in India, after dowry. Government intervention is a must to break this debt cycle, said health activists. “Given that the consumer has no choice and the decision to buy medicines is taken by the doctor, it is government’s responsibility to care for patients,” said Jyoti Mirdha, member of Parliament from Nagaur in Rajasthan. She had recently raised questions in Parliament on medicines becoming unaffordable. She said the Union ministries for chemicals and fertilizers (MoCF) and health and family welfare, should work together to reduce prices of drugs (see: The way out). Lack of coordination between the two ministries is a major reason for the drug price spiral. The National Pharmaceutical Pricing Authority (NPPA), which controls and monitors prices of drugs, is under MoCF while the Drug Controller General of India who approves the drugs for sale reports to the health ministry. The NPPA controls the prices of schedule-1 drugs through the Drug Price Control Order that lists 74 drugs. Over time, many drugs have been removed from this list and the drug controller has been approving expensive drugs in their place. The price control is limited to the reference molecule (basic salt molecule) in a drug. “The pharma manufacturers tweak the reference molecule to escape the price control order. They then take approval from the drugs controller and sell the new drugs at a higher price,” explained Pratibha Siva, a legal activist with the Lawyers Collective, an advocacy group. This way, many price controlled drugs have vanished from the market and are being replaced by more expensive drugs as seen in the case of the anti-asthmatic drug Theophylline that used to cost Rs 3 for 10 tablets, said an activist. It was replaced with Doxophylline, priced between Rs 45 and Rs 83. Result: consumers had to pay 25 times more for the same drug. Gulhati said the government can check this practice by regulating profits on compounds of the same class. For drugs outside the government schedule, the manufacturers are not allowed to raise the price by more than 10 per cent of the marked price every year. This is hardly a deterrent as initial base price is never reviewed and kept very high and the 10 per cent annual increase is a bonus, said Gulhati. Health experts said both the price control order under MoCF and the list of essential drugs maintained by the health ministry need to be revised regularly to make public healthcare affordable. Instead of strengthening the price control system, the government has been diluting it every few years. In 2002 it tried to reduce the number of drugs under price control from 74 to 34, under pressure from the pharma lobby. The Supreme Court stayed this and asked the government to first decide the basket of essential medicines to be kept under price regulation and determine the methodology for it. In 1970, about 90 per cent of the drugs had regulated prices. Now it is 10 per cent. Many times price controlled drugs, too, are sold at prices higher than the marked price. An MoCF official said an inter-ministerial high powered committee has been set up to recommend a framework for ensuring quality drugs at affordable prices. The panel will submit its report next year. MoCF had earlier proposed to bring drugs in the essential medicines list under drug price control in the draft pharma policy of 2006. The policy was put in cold storage after it was submitted to the group of ministers headed by agriculture minister Sharad Pawar. Capping profit margins of the pharma companies can also help reduce the drug prices. “Otherwise pharma firms will find ways to stay out of price control and keep prices high,” Mirdha said. Chinu Srinivasan, of Low Cost Standard Therapeutics (LOCOST), a nonprofit and small-scale pharma in Vadodara, said an essential drugs policy should be in place to make low-cost drugs available to the public. Pharma companies opposed any cap on their profits. “It would send a negative signal to investors seeking to fund new medicines,” said Mark Grayson, spokesperson for Pharmaceutical Research and Manufacturers of America, which has Pfizer and Merck, among others, on board. He said even with patents, eight out of 10 drugs do not earn enough money to support the cost of development, much less earn profit. Ranjit Shahani, president of OPPI, said India has over 7,000 drug companies selling more than 27,000 brands of drugs. The competition will regulate the price, he said.The pharma companies have a lot to gain by maintaining status quo. The consumption of pharma products in India is projected at Rs 96,000 crore in 2015 against present consumption of Rs 61,440 crore. Patients visiting public health centres in Nagaur district in central Rajasthan these days rarely buy branded drugs. 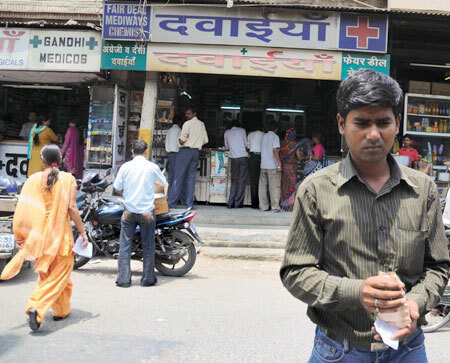 Doctors direct them to the government- run generic medicine stores (GMS) where quality drugs are available at low cost. The district administration of Nagaur has managed to free the public health system from the stranglehold of pharma companies by adopting a multipronged approach. Doctors were persuaded to prescribe only generic medicines and these drugs were made available by opening GMSs in governmentrun health centres and hospitals. Earlier, doctors were prescribing drug brands of reputed pharma companies, saying generic drugs do not have the right potency. Last October, the district administration appointed a panel of medical experts to identify pharma companies that manufacture quality generic drugs. The experts drew a list of 57 such companies and prepared a list of 570 drugs commonly prescribed by doctors. The listed companies were then invited to supply drugs through open tenders. The companies quoting lowest prices bagged the contracts (see table). To make sure doctors follow orders, their prescriptions are scrutinised regularly; the chief medical officer of Nagaur submits a weekly report on medical prescription patterns to the administration. That the system is working well could be seen at the primary health centre in Basni village, nine kilometres from Nagaur city. A long queue of patients waited outside the doctor’s room. Javed, a labourer, approached the doctor with symptoms of food poisoning. Mushtaq Ahmed, the doctor, directed him to the GMS at the health centre with the prescription. The medicines cost Javed Rs 67. “The same drugs would have cost him Rs 200 if he were to buy branded ones,” said Ahmed. 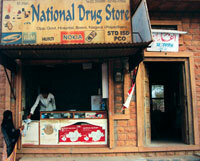 The generic drug store in Basni is proving a big hit ever since it became operational on May 5. It is giving the private chemists shops a run for their money. Sanjari Medical Store, a private drug store near Basni health centre, closed within a month of the GMS becoming functional. “We closed because our business went down,” said Fatima, whose son used to run the store. “We used to earn up to Rs 2,000 a day. After the GMS opened, our profits were down to Rs 100-150 per day,” she added. Another private store nearby, National Drug Store, is about to close for the same reason. 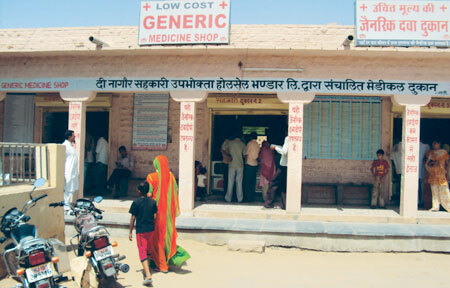 The GMS at the government hospital in Nagaur has similarly affected sales of the private drug store across the road. “My sales are down 60 per cent,” said Rahul Sharma of JP Medical Store. Seeing the success of GMSs, the chemists’ association of Nagaur is now offering generic drugs at prices 50 per cent less than the printed cost and has asked the authorities to publicize this. The concept of GMS is the brainchild of Samit Sharma, Nagaur’s district collector, who first introduced the scheme in Chittorgarh district where he served from July 2008 to September 2009. “I realised drugs are not costly, they are just overpriced,” said Sharma, a doctor by qualification. He said most government doctors were prescribing medicines by brand name which prevented competition and created monopoly in the market. This enabled companies to put a very high retail price on their products. Sharma decided to break the system to make drugs affordable. The GMSs in Nagaur are self-sustaining. The bulk-procured drugs are sold after adding 20 per cent administrative and handling charges to the lowest tender price. This generates sufficient revenue to meet the pharmacists’ salary, electricity charges and other expenses. “The project also generates some profit which is used to add more low cost drug outlets,” said Rajiv Soni, district programme manager of the National Rural Health Mission in Nagaur. The GMS experiment has also helped decrease the medical expenditure on pensioners in Nagaur. Data provided by the district treasury office showed the state saved Rs 39.22 lakh between October 2009 and March 2010 on health spending under the state pensioners’ medical fund. The scheme provides pensioners and their spouse free medicines worth Rs 5,000 a month. Incidence of pensioners exceeding the Rs 5,000 limit has decreased 40 per cent in a year after drug costs decreased, said K Paliwal, the district treasury officer. Another state where efforts to decrease spending on drugs has paid off is Tamil Nadu. The Tamil Nadu Medical Services Corporation, set up in 1994, procures affordable drugs through open tendering. The corporation has drawn a list of 260 generic drugs; hospitals can ask for drugs outside this list only in special circumstances like treatment for kidney ailments and cancer, said K Gopal, managing director of the corporation. Twentyfive of the 32 districts in the state have warehouses for storing generic drugs. Hospitals are allowed to draw a month’s supply at a time. Branded drugs can be purchased in special circumstances. But there are some practical problems in promoting generic drugs. 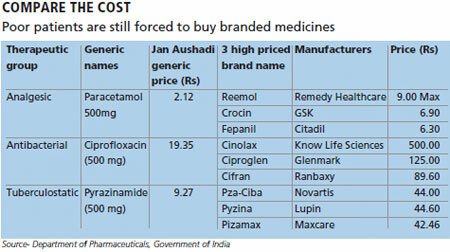 Some healthcare experts believe going generic is not the long-term solution for providing affordable medicines. C M Gulhati, editor of MIMS, said generic medicines can be prescribed for single-ingredient products like aspirin. In the case of combination drugs, brand names would have to be prescribed (most generics are single ingredient drugs). It is not possible to write detailed composition and accurate quantities of each ingredient in prescriptions, he said. Besides, all drugs patented after January 2005 are monopoly products. Marketing their generic versions is banned till the patents are in force. The generic drugs also do not cover many life saving combinations. “Some of the latest patented drugs may provide better relief in case of diseases like cancer, AIDS and diabetes,” said Dara B Patel of the Indian Drug Manufacturers Association (IDMA). Activists disagreed with drug manufactures. Leena Menghaney, campaign coordinator (India) of Medecins Sans Frontieres, said India should build on its reputation as a generic drug supplier. “Developing countries like Thailand, Ecuador and Brazil buy generic drugs from India for their public health programmes. We need to revolutionise our generic drug production by seeking more compulsory licences for production and supply of generic version of patented drugs for our public health programmes,” said Menghaney (see: ‘Generic drugs offer business’). Jyoti Mirdha, member of Parliament from Nagaur, cautioned that the Nagaur model is only a stop-gap measure. “If this measure becomes a rule, it could prove counter productive, as India does not have an anti-trust law like the US,” she said. The law discourages companies from forming cartels and fixing the price of a product. Bindeshwari, a scrap dealer in Punjab’s Ludhiana district, was asked to buy Cefzy-250 by the doctor treating his wife. She had delivered a baby in the government civil hospital in June-end. The chemist at the hospital’s Jan Aushadhi Store gave Bindeshwari Ceftazidime, a generic version of Cefzy- 250; both drugs contain the same salt and are used for treating general infection in women post delivery. After a while Bindeshwari was back at the store clutching the injection vial. Punjab is one of the eight states, along with Delhi and Rajasthan, where state health departments have issued specific orders to government doctors to prescribe only generic medicines. These are made available through special outlets opened after the launch of the Jan Aushadhi campaign in April 2008 by former Union chemical and fertilizer minister Ram Vilas Paswan. The aim of the scheme was to make available to people low-priced medicines equal in potency to branded drugs. The drugs are sourced by public sector pharmacies. But few government doctors prescribe them. Jaipur has two Jan Aushadhi Stores (JAS) in Jaipuria hospital and Kanvatita hospital. Both stores look deserted. “It is very rare that a doctor prescribes generic medicines,” said Praveen Kumar Mangal, pharmacist at the JAS at Jaipuria hospital. N K Vashishtha, principal medical officer of the hospital, said it is difficult to monitor doctors. “Besides, most of the drugs are not available at the JAS,” he said. The JAS scheme has made little progress in two years. There are 44 such stores in the country. This is just a drop in the ocean considering there are over 500,000 retail pharmacy shops in the country, said Chinu Srinivasan, managing trustee of Low Cost Standard Therapeutics. He said there should be at least one JAS in each taluka. The Union chemical and fertilizer ministry, it is learnt, is planning to expand the number of JASs. It has also decided to tap small and medium enterprises (SMEs) in the pharma industry to shore up supply of generic medicines. There are about 6,000 such enterprises in India. At present, only central public sector units are supplying generic medicines to the JASs. Besides, the government is also trying to revive the central units by providing assistance for repairs and replacement of machinery. The ministry has proposed a budget outlay of Rs 40 crore for its pharma units in 2010-2011. The small enterprises are uncertain if the government proposal would benefit them. “Where are the JAS outlets? The existing stores sold drugs worth just Rs 2 crore last year against the total domestic sale of Rs 50,000 crore,” said Jagdeep Singh, general secretary of SME Pharma Industries Confederation. C M Gulhati, editor of the (MIMS), said the government should seriously focus on a public awareness campaign to popularise Jan Aushadhi stores. “Unless patients are empowered, the scope of Jan Aushadhi stores would remain limited,” he said.